Doctrine is the word Christians use to define the truth-claims revealed in Holy Scripture. Of course there is a multitude of churches, church networks, and denominations, each with their own doctrinal statement with many points of disagreement. But while Christians disagree on a number of doctrines, there are key elements that cannot be denied by anyone claiming to be a follower of Jesus. In Doctrine: What Christians Should Believe, Driscoll and Breshears teach thirteen of these key elements. This meaty yet readable overview of basic doctrine will help Christians clarify and articulate their beliefs in accordance with the Bible. 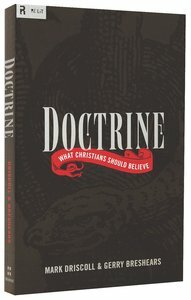 About "Doctrine: What Christians Should Believe"
Doctrine is the word Christians use to define the truth-claims of Holy Scripture. Of course there are many churches, organizations, and denominations, each with a unique doctrinal statement. But while Christians may differ on numerous issues, there are basic tenets of the faith that should be denied by no one claiming to be a follower of Jesus. In Doctrine: What Christians Should Believe, Driscoll and Breshears teach thirteen essential elements of the Christian faith. This comprehensive yet accessible overview of basic doctrine will help Christians clarify and articulate their beliefs in accordance with the Bible. Now available in paperback. Pastor Mark Driscoll founded Mars Hill Church in Seattle in the fall of 1996, which has grown to over 6,000 people in one of America's least churched cities. He co-founded and is president of the Acts 29 Church Planting Network, which has planted over one hundred churches in the U.S. and internationally. The Resurgence Missional Theology Cooperative Outreach magazine has recognized Mars Hill Church as the ninth most innovative and fifteenth fastest-growing church in America. His writing includes the books The Radical Reformission: Reaching Out Without Selling Out, Confessions of a Reformission Rev. : Hard Lessons from an Emerging Missional Church. He also contributed to the book Listening to the Beliefs of Emerging Churches. His most recent publications are Vintage Jesus: Timeless Answers to Timely Questions and Death by Love: Letters from the Cross. Gerry Breshears (PhD., Fuller Theological Seminary) is professor of theology and chairman of the Division of Biblical and Theological Studies at Western Seminary. Dr. Breshears has taught at numerous Bible colleges and seminaries around the world and is a frequent guest on various radio and TV programs. He is the co-author of Vintage Jesus: Timeless Answers to Timely Questions and Death by Love: Letters from the Cross. Customer Reviews For "Doctrine: What Christians Should Believe"
This book is a must read for all Christians. It puts doctrines that may seem complicated in a very simple and understandable way. Written in the typical Driscoll style it is a book that can be referred back to and re-read multiple times. Love it! This book is a fantastic companion to the Mars Hill 'Doctrine' sermon series, and also as a stand-alone theological reference book. New Christians may be put off by its size and seemingly-heavy theological language, however most topics are systematically explained. One of the things I love about Mark Driscoll's books is that every statement or argument is backed up with relevant Scriptures. This book is written for the 'thinkers' of theology, and for those who appreciate logic and evidence. Driscoll and Breshears always aim to present Christ as the foundation and cornerstone of all areas in life and theology - this book is no exception. This is a wonderful book for new Christians or those who are unsure of the Christian doctrine of their faith. It is well researched and well set out. There is an index in the back which is helpful. It has in depth explanations for those who aren't experts in theology. It is easy to read and sticks to the scriptures. If you are new to the Christian faith or haven't studied doctrine and theology before this book will be a benefit.